Is kind and caring, although initially slightly selfish. She carries the Crest of Sincerity. (Source: Wikipedia) Mimi is self-centered and obsessed with her outer appearance. She's used to royal treatment so living in the Digital World isn't exactly her cup of tea. Deep down inside, she's a very sweet girl. Her digimon partner, Palmon, tries to help her understand that outer appearances aren't everything. Mimi possesses the crest of sincerity. 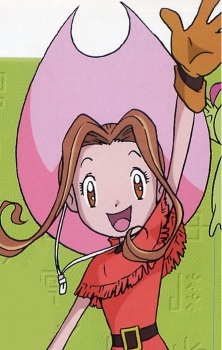 In 02, Mimi spends a lot of time in America. She returns with her hair dyed her favorite color (pink, if you couldn't already guess) and a new wardrobe. She still acts like a princess, but has matured enough to know that there are more important things in life.